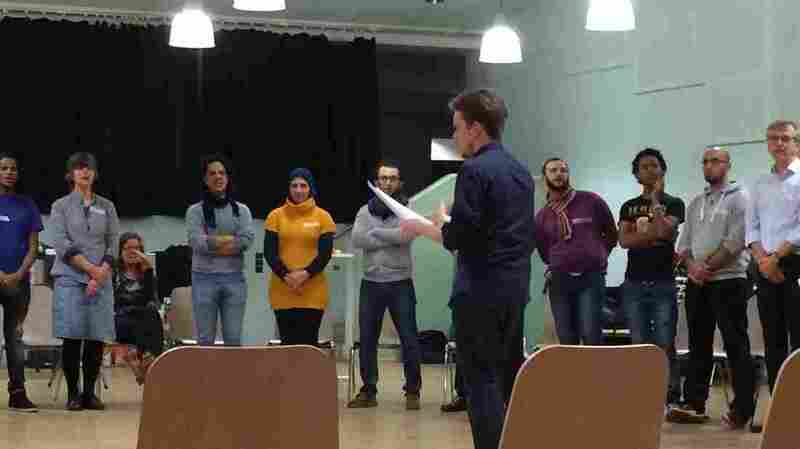 Germans, Migrants Share A Choir Where The Singing Is Secondary : Parallels Berliners and migrants are getting to know each other through popular songs from Germany, Syria and Eritrea. Every German interested in joining must bring an asylum-seeker with them. Members of Berlin's recently formed Begegnungschor Choir (Getting To Know You Choir) rehearse. The 50-person choir is made up equally of Germans and asylum seekers, who are from Syria and Eritrea. For many members of Berlin's recently formed Begegnungschor Choir (which roughly translates as the Getting To Know You Choir), meeting migrants is nothing new. Most of them regularly help out at shelters, like thousands of volunteers throughout Germany. But for volunteers and migrants alike, these encounters rarely lead to more than a welcome smile, a helping hand and a grateful nod and hardly foster integration. Hella Keilinghaus, a retired teacher, gives free German lessons to newly-arrived Eritreans. She acknowledges that volunteering can be tough. "When you work with the refugees and go to their homes, sometimes it's so sad to hear how they live and where they come from," she says. But she says that at choir practice, where some of her language students belong to the tenor section, she can shake off her role as a helper and simply get to know her students as fellow singers, on equal footing. Another volunteer, Katharina Lovreglio, 52, is a café owner and music lover and frequently cooks for refugees. She says she felt compelled to help: "I cannot explain it exactly because it's coming from my heart." Lovreglio reveals that she relates to refugees because she too fled her home country – former Communist East Germany – albeit under very different circumstances. "I was not coming from a war situation. So it's not the same, but I feel something like this also," she says. Warming up their voices for what is only their eighth week of rehearsals, the choir is already 50 strong. Half are so-called "old Berliners," while the other half, the "new Berliners," are from Syria and Eritrea. Founder and conductor Michael Betzner-Brandt says some of the songs the Syrian choir members have brought with them are a real enrichment to his own musical education. "The melodies are very intricate and beautiful, but not always that easy to sing. For us, of course, it's also the language which makes some difficulties," he says. He admits that choosing suitable repertoire is a bit of a challenge because the subject matters can be a little sensitive. "There are many German folk songs and they are quite difficult, it's about leaving your home," says Betzner-Brandt. "Or another is 'I Am Sailing,' but the refugees came over the sea, so you can't take any song." But this hasn't stopped him bringing out John Lennon's optimistic holiday song, 'Happy Christmas (War Is Over)' for next week's advent concert. At the evening rehearsal, the choir sang it with gusto. One of the new Berliners is Mohammed Abdol-Rahman, 35, a Syrian journalist who fled Damascus and arrived in Berlin seven months ago. He says he's proud that he can at least make a musical contribution to the city in which he wants to settle. "Music is an international language, no need to understand what we sing," he says. "They asked me if I can sing any song in Arabic and I sang this one, 'Nassam Aleyna El Hawa.' And they like it." The choir is so enamored with the song, popularized throughout the Middle East by the Lebanese singer Fairuz, that they sing it weekly. For Abdol-Rahman, this is a very vocal sign of acceptance. He is still waiting to hear from the authorities about his asylum application, and whether he can bring his father and brother to Germany as well. While he waits, he takes comfort in the company of his fellow singers.